Quebec City is known for its unique historic neighbourhoods, and here John Little captures a vibrant scene at the corners of St-Olivier and Sutherland streets. The narrow twisting streets, gable-roofed buildings and small corner stores and bistros are the charming setting for the action on the street - children playing and a group gathered around a horse and sledge. The horse-drawn sledge, something commonplace in the past, contrasts with the modern cars parked further up the street. Typical of his work in the 1960s, Little’s brushwork is loose and fluid, with streaks of tracks through the snow adding a sense of movement. Although the day is overcast, the light is luminous, brightened by the white of the snow. Adding further to the vivacity of the scene are the splashes of colour throughout, from the red signs to the blue of a child's coat, a roof and a parked car. 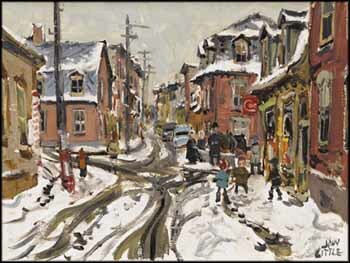 This is a classic winter painting from Little's oeuvre, reflecting his interest in both architecture and in the life of the people in urban neighbourhoods such as this.